A recent strategic partnering survey by Nice Insight asked participants working at midsized and large cap pharmaceutical companies about their business’ long-term strategies for maintaining a strong drug development pipeline. Their responses confirmed a common practice that is continuing to grow in popularity — integration of biopharmaceuticals through partnerships or acquisitions to supplement a weakening pipeline. In fact, 56% of respondents indicated that their company is looking to partner with a large biopharmaceutical company to strengthen their development pipeline, and 51% stated the company they work for is looking to purchase a small biopharm company. Another 37% want to partner with a small biopharm company, and 22% said their company wants to purchase a small biopharm company’s compounds. Only 13% stated that their company’s drug development pipeline is strong. The drug development industry is motivated to invest in developing biopharmaceuticals as a form of pipeline security because these products have demonstrated profitability. The practice of partnering with or acquiring biopharmaceutical companies is mirrored in the results of the Nice Insight Pharmaceutical and Biotechnology Outsourcing survey, where 71% of respondents stated the company they work for engages in the development of biologics-based therapeutics. Of these respondents, 77% will outsource biomanufacturing in 2012 and will spend just over half of their outsourcing budget on the development of biologics (54%) — compared to 46% of the outsourcing budget spent on conventional therapeutics. This bodes well for contract service providers, both in terms of winning outsourced biomanufacturing projects and also for the long term, as CROs and CMOs will likely perform the R&D and manufacturing of new biosimilars/bioequivalents for biologics that come off patent in the coming decade. This means it may be a good time to start considering CROs and CMOs for biologics projects. The Nice Insight Brand Index includes twenty-eight contract manufacturing organizations that offer biomanufacturing services. Five of these CMOs stand out from the rest, in that they have been consistently identified as businesses that the respondent pool considers for custom manufacturing projects throughout 2011 and 2012. These standout companies are Baxter Biopharma, BioReliance, Boehringer Ingelheim, DSM Biologics and GlaxoSmithKline Biopharmaceuticals. The data also showed five companies that shifted from being infrequently considered to frequent consideration for biomanufacturing projects. CMC Biologics, Cytovance Biologics, Laureate Biopharma, Lonza and Paragon Bioservices* all increased their likelihood of winning a large molecule custom manufacturing project between Q2, 2011 and Q2, 2012. Nice Insight reviewed these companies’ customer perception scores to see if there was a correlation between one of the key outsourcing drivers and this increased likelihood of being considered for a project. Interestingly, productivity scores tended to remain steady or show a slight decline, as did customer perception scores for regulatory compliance. However, the data showed that companies earning higher scores in 2012 with respect to reliability and quality also increased their likelihood of being considered for a custom manufacturing project. There was an occasional exception, such as when a company’s 2011 score exceeded 80%. It is difficult to maintain scores in the “excellent” range (80%-100%), let alone improve. 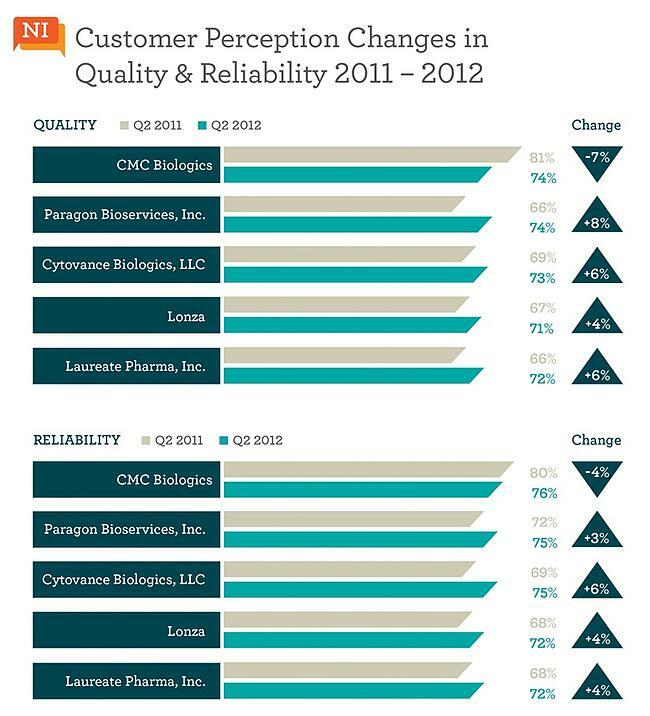 However, CMC Biologics — the only company with a drop in reliability and quality scores — still came out on top, receiving the highest customer perception scores for these drivers among the group. This bodes well for contract service providers, both in terms of winning outsourced biomanufacturing projects and also for the long term, as CROs and CMOs will likely perform the R&D and manufacturing of new biosimilars/bioequivalents for biologics that come off patent in the coming decade. With biotherapeutics expected to outpace conventional therapies in the next decade — S&P industry data predicts that biotechnology products will account for 48% of the top 100 drugs in 2016 — it is a good time to identify prospective outsourcing partners and begin developing relationships. Consideration of the companies mentioned above is a good start, but this may end up costing more than joining forces with a smaller, lesser-known CMO. In which case, outsourcers can start by looking for contract manufacturers with strong quality and reliability scores, as these attributes are continually ranked as the #1 and #2 drivers influencing partner selection by survey respondents. *Paragon Bioservices currently offers GMP manufacturing for clinical trials, with an eventual commercial manufacturing launch.